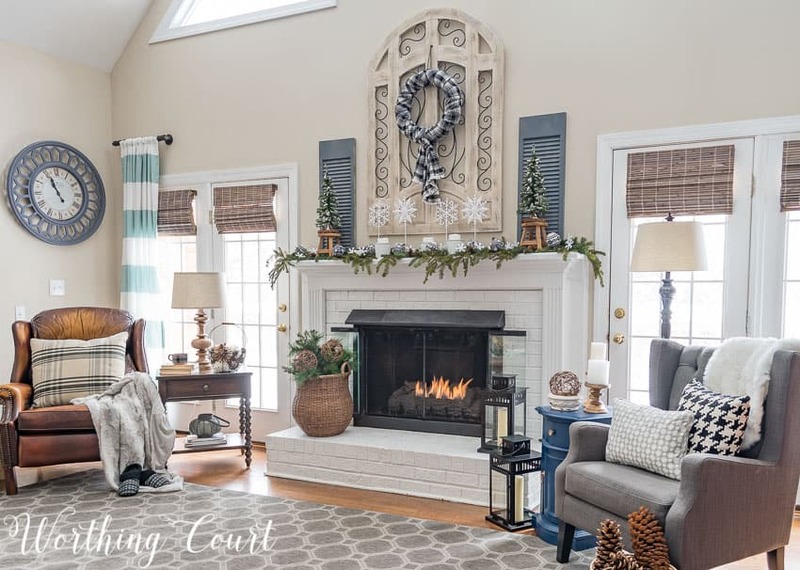 These tips for your indoor environment will help combat cabin fever and help you to find contentment in your home during these seeming endless weeks of winter. The calendar says that winter is halfway over, but this is the time of year that I always begin to wonder if winter will ever end and if spring will ever arrive! In my neck of the woods, winters consist of mostly dreary, gray days and we often get a few ice storms thrown in for good measure. Not my cup of tea at all! Once in a while we’ll get a warmish sunny day and that makes it so hard for me to be patient and feel contented right here in the middle of winter. I know in my heart that spring is just over the horizon, so even though it isn’t here quite yet, there are some small things that I can do in my own home to help me “survive” the remaining days of winter that seem to drag on forever. Tip #1: Bring the outside in. Whether real, artificial or dried, adding just a few flowers or greenery to your home will say instant spring! I love to sprinkle a little something that’s green or blooming around all of the rooms in my house. In fact, I’ve added a total of five live plants to my family room in the past month. Fresh flowers from the grocery store, real or artificial boxwood anything and dried hydrangeas are a few of my favorites. Tip #2: Bring in natural light. As long as the sun is shining, I almost, almost don’t care how cold it is outside. I absolutely crave the sun this time of year. I try to take advantage of those few and far between sunny winter days, by throwing open those curtains and blinds and letting the sun pour into the house. Even better – I’ll get an instant mood lifter, by actually spending some time sitting in front of one of those warm and sunny windows! Tip #3: Use light colors in your home. 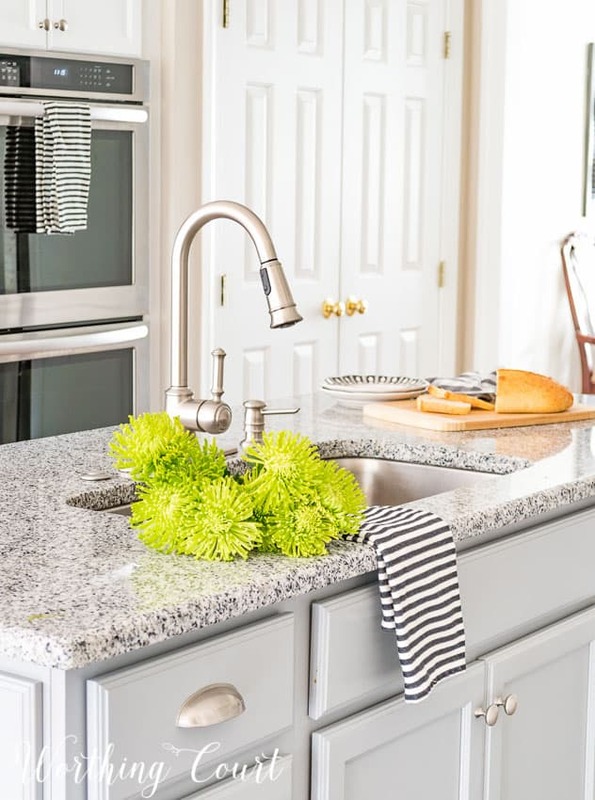 Yes, darker colors can make a room feel cozy, but if you’re combating the winter doldrums, adding white touches in your home will create the feeling of lightness that we all associate with spring. Try adding white pillows, accessories, throws or even a add white accent wall. You might be surprised at what just a little bit of white in a room can do! Thankfully, for those of us who crave the warmer weather, winter doesn’t last forever! I hope these simple tips will help to get you through until spring finally arrives. I just love the look of your house! Thanks so much for sharing these great ideas. I have started buying tulips almost every week. Tulips say Spring! I’m with you. Hate the gray, cold days of winter. Spring can’t come soon enough! Just the inspiration I needed on this gray February day! Enjoyed these hints to help with winter blues! You made such super suggestions. Thanks!! I needed this! So ready for Spring to arrive!!! All good ideas! I love getting inspiration from your house. It’s gorgeous! I look forward to each new season. But I enjoy our Vermont winters. It is a time to putter around the house, making soup, working on crafts or cuddling in my favorite chair near our pellet stove with my precious pug on my lap. After Valentine’s day I will bring out my Easter decor and start to look forward to spring. Thanks for your inspiration. I can’t wait for the dull of winter to be over! Bring on spring! I love bringing the outside in, especially with flowers. Tulips make my day this time of year. We’ve been teased with warm days lately. I too so ready for warm to stay! Spring is one of my most favorite seasons! Thanks for the tips! I am so looking forward to having the windows open & letting in the fresh air. Great advice! I am already implementing your tips. Spring is coming! I want to bring home some daffodils. Nothing says spring like that. Thanks for some wonderful tips to brightening up my house! Fresh flowers is always my pick-me-up! Those little touches of spring green — boxwood, mossy spheres, etc. — REALLY make a difference. Come on, Spring! Thanks for sharing your ideas! I love to bring nature into my home as well–this helps tremendously with inching closer to spring. Love to see the green around my house!! Everyday we are getting closer! Here in NC, we have had a mild winter and my daffodils are blooming!!!! I fear they wish they were back in the ground as it will get down to 22 degrees tonight! Thanks for the tips. I am itching to pull out my nests, eggs and forsythia, but it just isn’t time yet. Would love to let the sun in…if it would come out. Great ideas! I love your ideas for surviving dreary winter days! We had a tase of Spring for the last days in VA. Today back to Winter. Thanks for your tips!! I especially love those dried hydrangeas above your buffet! Hydrangeas make me smile any time of year! Thanks for the tips. The winter months are so long up here in the north and sooo grey. It’s hard to get motivated. I’m going to try a couple of your suggestions. Hydrangeas are my year round favorite…can’t get enough! Suzy – You are so right! I put away the Christmas décor and to avoid the house looking so bare, I leave some winter “seasonal” pine and a snowman or two. I leave just enough to transition to Valentine’s Day and then on to Spring! But, our temps here in the Northeast have been in the 50’s and even reached 65 degrees one day in early February. My heart sang! I went outside and walked along the yard looking for signs of Spring, enjoying the sunshine and being outdoors. Alas, my snowmen looked so out of place – but a fickle girl, Miss Winter is. I resisted the urge to get out tulips and birds’ nests. Today, we have four inches of snow on the ground. And those winter greens and snowmen look just fine! It does look closer to spring in the Worthing Court Manor… Really starting to like the blue/green combination. Blue flowers and mason jars and green box woods. Great touches!! I love all your touches it makes it personal and cozy. You make some great suggestions. One thing I would do differently though is instead of sitting in front of that sunny wondow i would take a walk – even if it were just around the yard. More great ideas, Suzy! PS? Is there a tutorial on how you made your wall sconce plaques? Excellent ideas. I need to find me a boxwood wreath that doesn’t look phony! Your breakfast room is to die for! But I’ve said that numerous times on here, lol! Great ideas. Adding flowers to my shopping list. Like how you mix painted accessories with your wood furniture. I feel the xact same way, sort of pacing myself through winter, expecting lots of rain today. 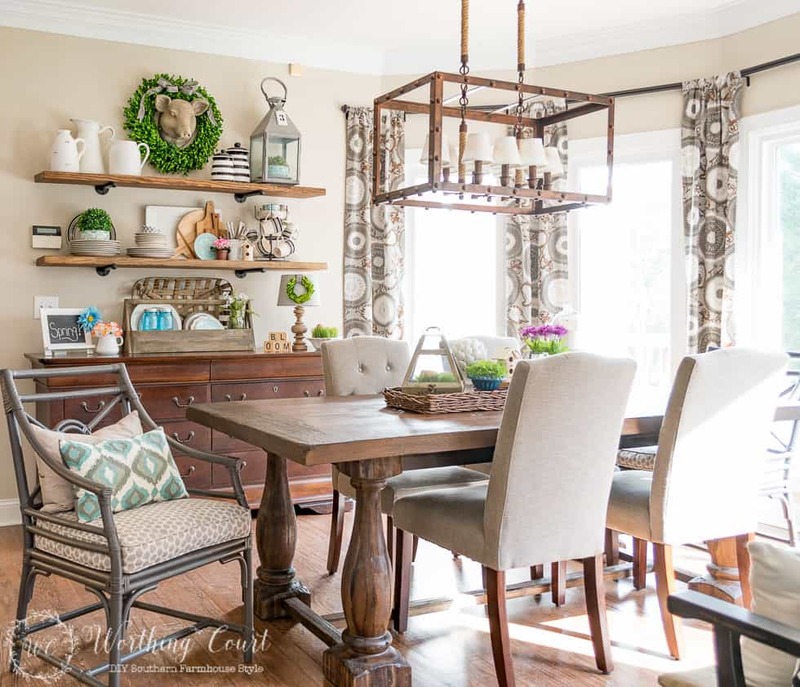 I agree with the commenter above…love mixing painted and wood pieces! So Cal has had an unusual amount of rain this winter. I was surprised when I realized that an entire week of cloudy, rainy weather drained my energy! I love your style! I’m definitely ready for Spring here! We’ve had some warmer spring-like weather the last few days, but today Winter is back and no snow to justify the cold. I think I will pull out my spring floral arrangements to help with my blah, over it feelings. Thank you for the advice! I love winter and the slow peaceful time it brings. Hot, humid summers are not my cup of tea. Embrace winter!! We have had such crazy weather this winter. I believe we are in for an early spring as everything is already starting to bloom, but we’ve experienced freezing temps in early April in the past, so who knows. Great tips. Thanks for the encouragement, Suzy! I wish we had a winter!!! I’m in Florida and we haven’t had hardly any cold weather. I hope Spring comes soon for you! Going for some “faux” greenery right away. Go away WINTER! Your weather sounds alike like Oklahoma. We were 28 degrees this am and 70 degrees by mid-afternoon. Crazy! No wonder we are all sick with sinus trouble! This was an awesome inspiring post. Having just got back from Disneyland with sun and 78 I feel like winter will never end. I think if I could afford to break up winter with a January or Feb vacation each year going someplace warm would be nice. However not sure the checkbook would agree. Will try some of your hints. Thanks for sharing. I already have a few daffodils blooming, so I cut a few to bring inside to enjoy and it`s amazing how cheerful they look. such a mood changer. Love fresh flowers in the house. My treat to me! Thanks for the good tips. We’ve had a mild Winter in the Fort Worth, Texas area so I feel very blessed but I will be happy to welcome Spring! I have been using lots of preserved boxwood around the house since taking down the Christmas decorations. It really helps make the house less bare looking. I agree with adding white to your decor. I recently added white drapes and white dishes to my dining room decor. Wow, what a difference! So, bright and light. I love adding flowers and greenery to my home! Hydrangea, Daisy’s, sunflowers and boxwood are my favorites! Thank you for your inspiration! All of your ideas are so inspiring’. Keep them coming!!! So ready for nice and warm spring weather with many sunny days!! Thanks for the hints. Feels like we haven’t seen the sun in forever. Have noticed it getting lighter in the mornings though and that makes me very happy. I love all of your whites and natural elements with just that right pop of color. 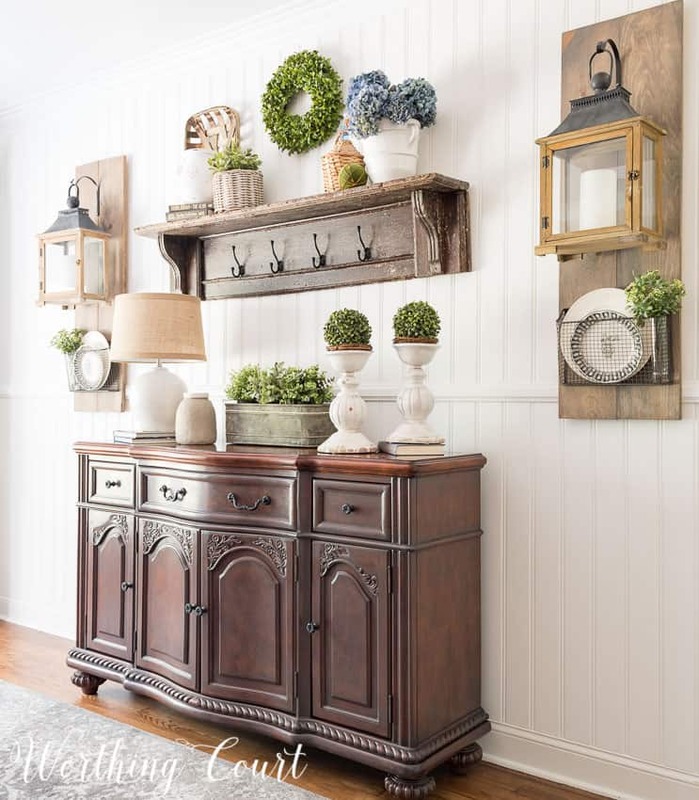 Your farmhouse decor is absolutely beautiful. On those cold and dreary days your decor always looks cozy. Spring flowers look so pretty in white vases and pitchers, I can’t wait for them to start blooming. Your house is gorgeous! Can’t wait to get your blog in my email , as you have great ideas! Love your greenery, especially the touches of boxwood. Suzy, I am curious. Is there a different side board cabinet in picture 2 and 3 ? One has drawers and one has doors. Hi Myrna. Yes, they’re two different pieces. The one with drawers is in my breakfast area and I use it to store all of my table linens, kitchen towels, tablecloths, etc. The one with the doors is the sideboard in my dining room. I painted it when I did the dining room makeover. Love your tips! I’ve lived in Phoenix AZ for many years and we are blessed with beautiful winter weather………but we are moving to Colorado this year and I’m certain I will be using these next winter! I enjoy your blog so much and look forward to it! Great ideas for the winter blues!! Suzy nothing brightens like a bit of white. I recently painted the living room/dining room white and the transformation is startling. I actually felt as if a cloud had been lifted. I know exactly what you mean – it’s amazing what some white can do to a room!